It's been a busy, busy week in my studio! 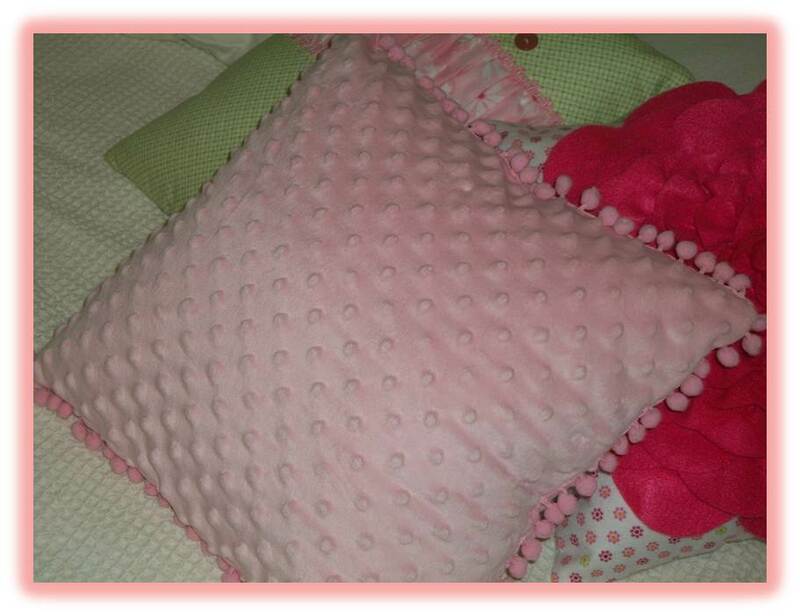 A few postings ago, I shared with you my grand-daughter's request for lots of pillows for her new big girl bed. Maggie and I camped out in my studio and kept my sewing machine humming. Pillow #1 is a simple square pillow made with the yummiest, butter-soft chenille fabric and pom-pom trim. I think it may just replace Eloise's "bah" (security blanket that she carries to bed). 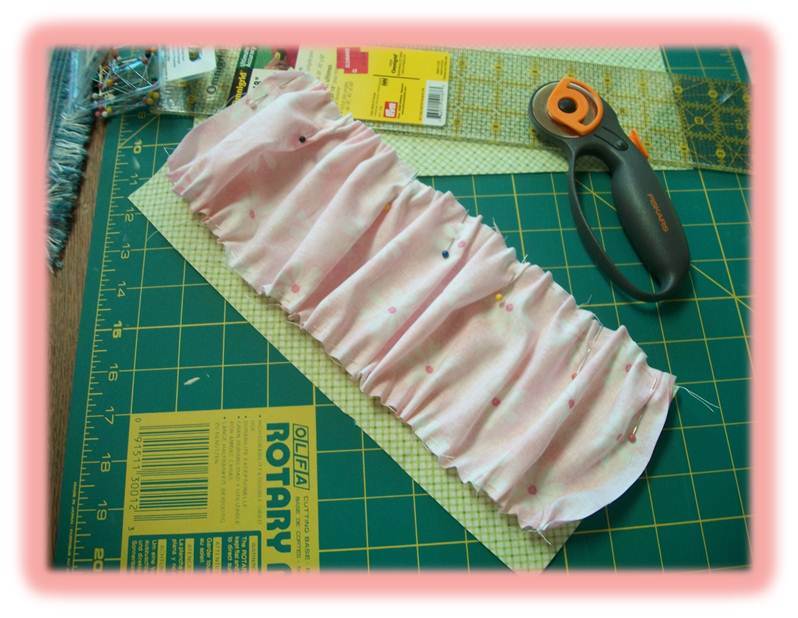 Inspired by the ruffles in the Gussy Sews collection, pillow #2 was made with baby-soft flannel with a ruffle inset. 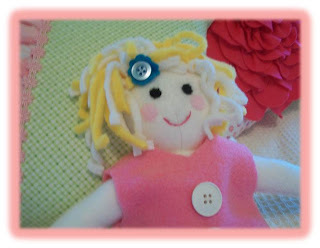 It was trimmed off with pink daisy chain and a few buttons. 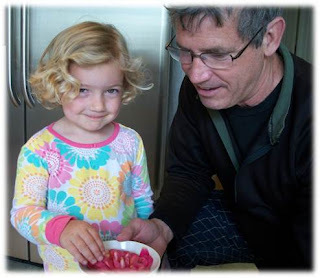 During our visit to see Eloise, my husband took her on a discovery walk where she found a pretty pink camellia that had just fallen from its bush. She brought it home and her Zeke showed her how to keep it fresh in a bowl of water. 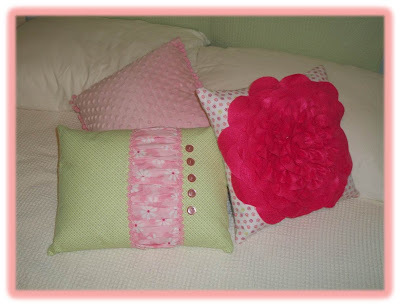 When she asked for pillows, I immediately knew that I had to make a pillow with a big pink camellia flower on it. I have been waiting for a reason to make it ever since I saw the original tutorial posted by Allison of Cluck Cluck Sew. I couldn't stop with just pillows for Eloise's bed. She asked for "other things" to put on it too. What could be better than a doll made in Eloise's image? 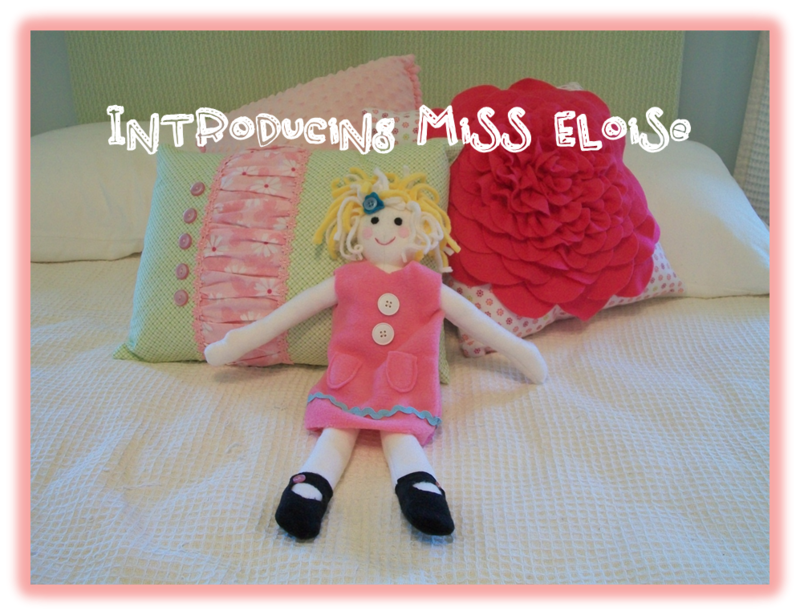 Using the pattern from my new Fleecie Dolls book (see this posting), Maggie and I stitched up a Little Miss Eloise doll. I wonder what she'll call her? Maggie (middle) spread out across the floor. She's claiming the left-over fleece for her own pillow. There was one other specific item on Eloise's wish list - a little light. She explained to me that her room is very dark at night and she doesn't like it (Daddy, if you're reading this - take note.) I just happened to have a night light that would fit the bill. 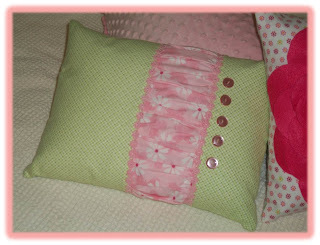 From the left-over fabric from the camellia pillow and the pom-pom trim came a pretty pink polka-dot night light and a matching lamp shade too! 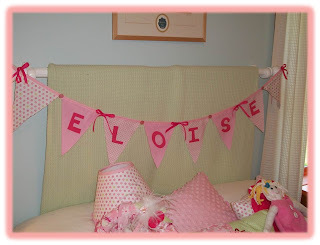 I thought her new room is going to need a few personal touches - like a banner for above her bed and a special photo of Eloise with her Zeke and Daddy, and a whimsical wreath for her door. No mistaking whose room it belongs to! One last thing for the little princess. She will be heading soon across the country to a new home on the East Coast. What would be better than to have a special goodie bag to make the airplane ride more fun?! 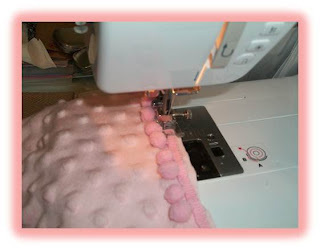 I fell in love with the little ruffled knapsack made by Marie at Not Very Domestic. I really loved the ruffles, but wanted a bag with a lining so I modified the Beach Bag pattern by Martha Stewart. I took the liberty of filling the ruffled bag with tons of toys, activities and treats for the plane. Didn't this turn out so cute? My mother has put in her order for a ruffled ditty bag too! 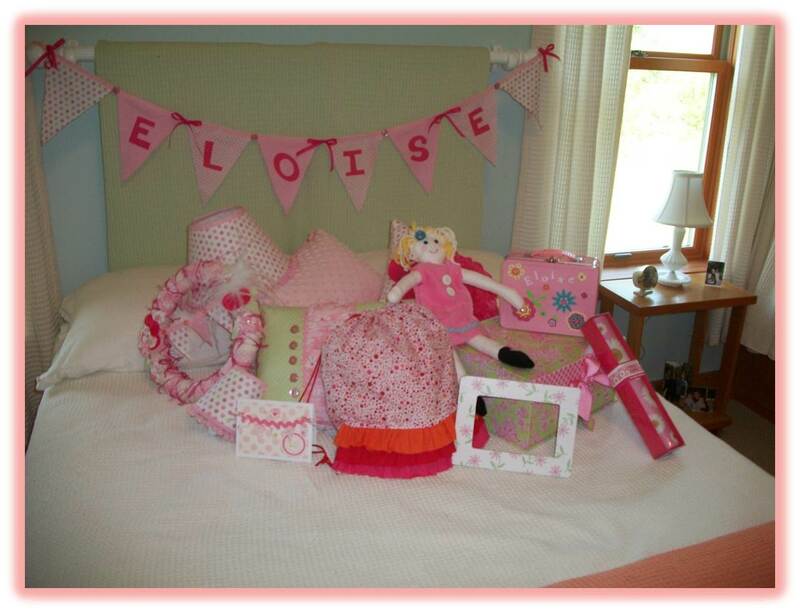 In fact, upon seeing the pink polka-dot bonanza, my mom said she was changing her name to "Eloise" - too funny! As Eloise's pile of loot continued to grow, I became more and more excited - the simple thought of the expression on her face when she opens her box of treasure. 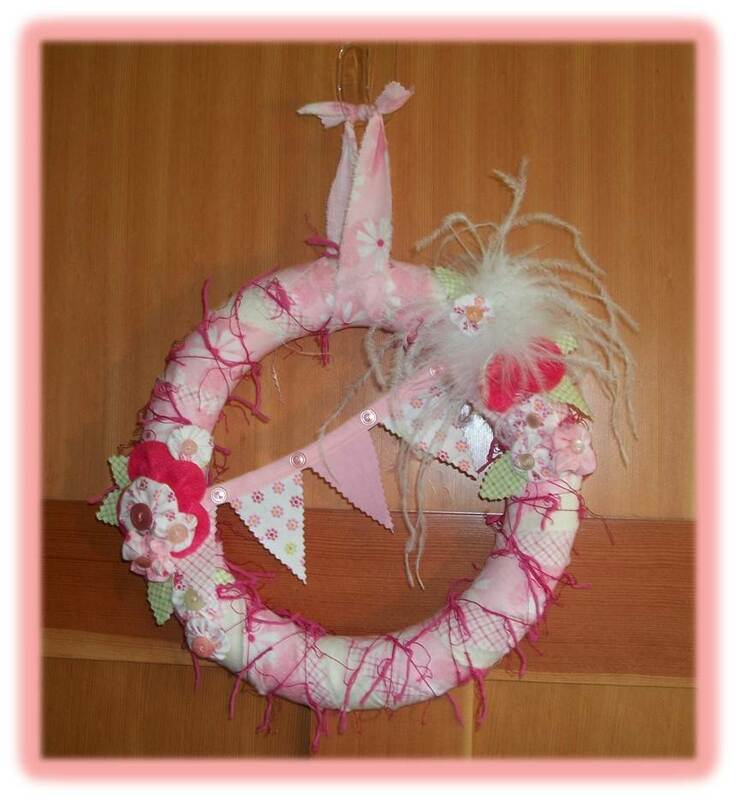 My creativity was running amuck sparking the flame for the next project. My husband commented on how this experience is the perfect analogy to describe how Our Lord must delight in fulfilling our requests. And so I say to you, be like a little 3-year old and ask Our Lord for pillows, lots of pillows, or whatever you are desiring. You may be surprised one day to see that He has fulfilled your requests beyond your wildest expectations. Don't be afraid to ask. Debbie, I am beaming reading this - you are so sweet to have done all of this. I cannot wait to see the pure joy on Eloise's face when she opens this!